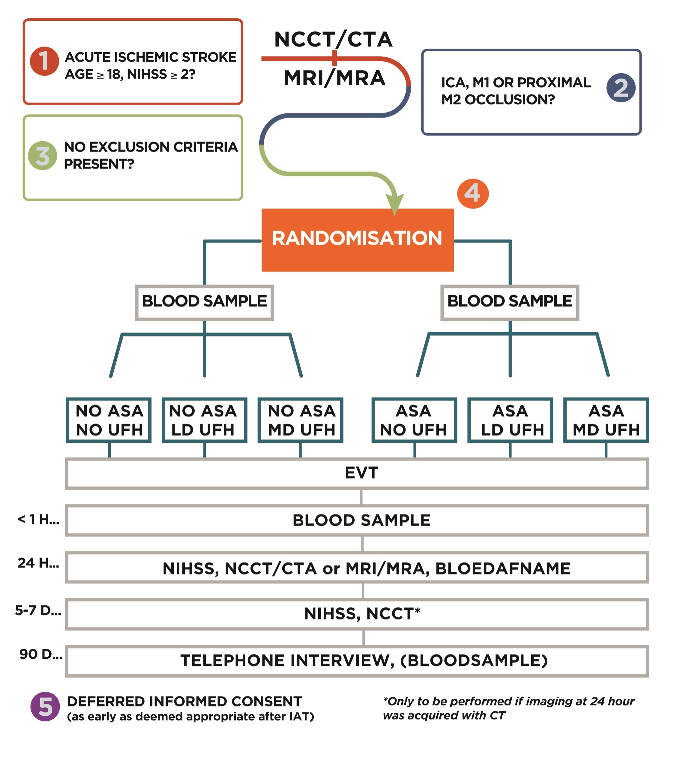 MR CLEAN-MED is a multicenter phase III randomized clinical trial with open-label treatment and blinded outcome assessment (PROBE), with a 2x3 factorial design. The study will run for 4 years in stroke intervention centers in the Netherlands. 1. No administration of ASA. 2. Treatment with intravenous ASA 300 mg.
1. No administration of UFH. 2. Low dose intravenous UFH: Loading dose of 5000 IU, followed by continuous infusion of 500 IU/hour over 6 hours. 3. Moderate dose intravenous UFH: Loading dose of 5000 IU, followed by continuous infusion of 1250 IU/hour over 6 hours.